Oceanville Retreat, offered by: Downeast Rentals & Real Estate. Link further below for more pictures and info. Deep water, oceanfront, post and beam, Salt Box Cottage privately sited down a 7/10 of a mile long driveway. Breathtaking views of the Deer Isle sailing lanes and sunsets. The ocean is full of activity including local lobster boats, schooners, kayaks, porpoise, and seals. Walk along the granite boulder shores, or the woods paths leading to a hammock or quiet sitting areas to watch the wildlife. The home offers a place of solitude and provides everything you could need for a great vacation. Town amenities and shops are only a five minute drive from the cottage. Deer Isle/Stonington is a small fishing village that is very dependent on the ocean and what it provides. The locals are a mixture of hard working 'Old Salts' and educated, creative cultures. The people here are very friendly and go out of their way to lend a helping hand. The Arts are very important in the town and are reflected in the many original art galleries, shops, and schools, Haystack Mountain School of Arts being one. We take pride in our performing arts as well and support a local performing arts center and Opera House that provides live performances and theater throughout the year. The Oceanville Cottage and our Island is a very special place, that once visited, will be held dear in your heart forever! Beautiful, deep water oceanfront. Lots of granite ledges to walk and at mid to low tide, a small pocket beach, and easy to launch a kayak or canoe. All mattresses were bought new in '07. Very nice quality linens too. Deer Isle is a special place for us due to family history of visiting it, it's unspoiled nature, and its artistic community. We have spent multiple weeks each of the past two years at the Oceanville Retreat and thoroughly enjoyed our stays. Its location in Oceanville is ideal to explore Deer Isle and Stonington, or just be at the property and enjoy the surrounding nature. The cottage is spacious and comfortable. We only needed one bedroom, but the two second floor bedrooms provided us with the ability to invite family and friends to join us during our stays. The location of the cottage provides views of the Deer Isle Thoroughfare, with its Windjammer traffic and lobstering activity. It also provides the ability to explore the coastline and wooded trails from the cottage. A special treat has been enjoying morning coffee, sunrises, and sunsets from the granite ledges in front of the cottage. The cottage and its furnishings are very comfortable and well equipped. Having WiFi Internet access (although intermittent at times) was a great benefit. The company that manages the rental of the property has been wonderful. The owners have also been great. During our first stay a circuit breaker tripped, and we initially had difficulty finding the circuit breaker box. However, a call to the owners quickly resolved the situation. 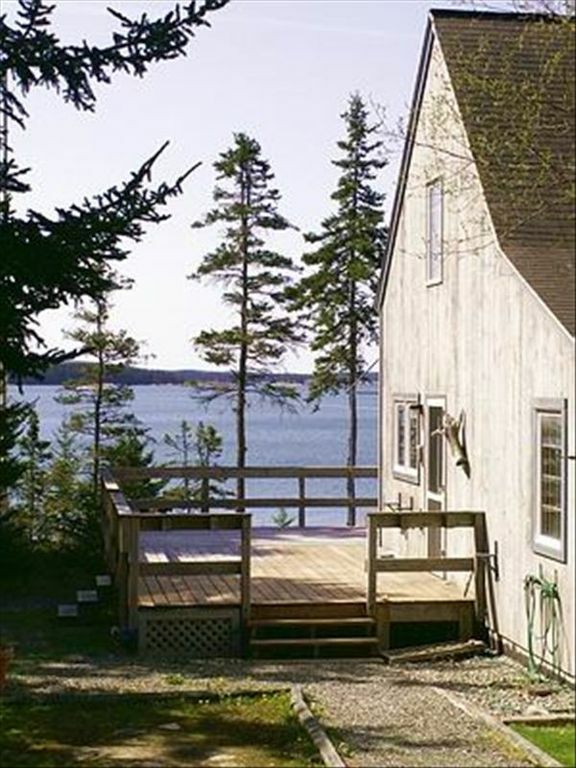 This is a great property in a wonderful location; and a wonderful way to experience Deer Isle. Oceanville retreat was described accurately regarding the location of the cottage. The photos did not accurately show the living area. The bedrooms were accurately displayed. No bathroom photos were shown. The property was not clean and well maintained. The kitchen stove, sink, floor and the bathroom floors plus the wood floors were dirty. The cushions in the living area were dirty, musty and the bedding, not the sheets and towels, needed to be washed. I did not contact the owner but did communicate personally with the rental agency in Blue Hill of our problem regarding the lack of cleanliness in the cottage. They offered to send out another housekeeper, but I had already done the cleaning myself. We enjoyed being in the Deer Isle area and Stoneington area. I would not recommend this cottage to my family or friends in the future unless I knew that the cottage had been up dated and cleaned with a better housekeeping staff.